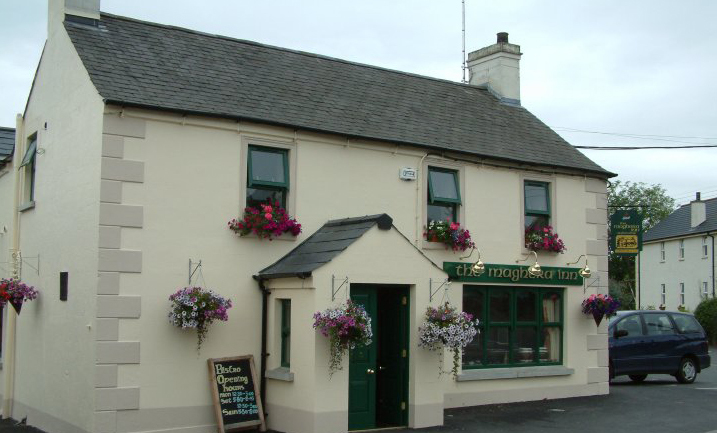 Living in Newcastle, Co Down, provides us with many great pubs and restaurants to dine out in, and among our favourites is the Maghera Inn, which is located in the small village of Maghera, between Newcastle and Castlewellan. The Maghera Inn is a small country pub which has built up quite a reputation both locally and nationally here in Northern Ireland in recent years for it’s food. Having been voted the 2007 pub of the year and 2nd in 2009 food pub of the year, the Maghera Inn certainly has the awards to back up this great reputation. A popular place for locals and visitors to the area, their is a friendly and welcoming atmosphere in this pub. The cosy surroundings make it a great location to enjoy pub grub whether you are with family and friends or seeking a romantic meal for two. Recently we visited Maghera Inn with a few friends for a night of food and drink. After one or two Becks, and a few glasses of wine, we took our seats, ready to enjoy a spot of Saturday night supper. With a reputation for serving some of the finest quality steaks in the Down District, steaks were the flavour of the night among our party of 4. As mentioned, steaks were the popular choice for the night with 3 of the party ordering a fillet steak cooked to varying finishes. 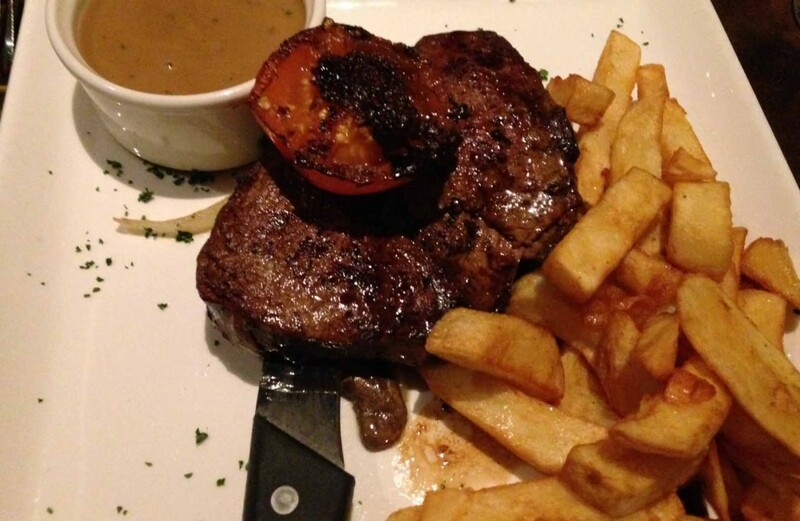 You’ve probably already recognised that we do enjoy a steak dinner on a night out, and The Maghera Inn certainly didn’t disappoint. The steaks were cooked to perfection and were served with some peppercorn sauce and thick chips. The fillet steak dinner also comes with a grilled tomato, so if you are a fan of other sides like salad (really!!) or onion rings with a steak, you will need to order these separately. There’s plenty to eat on the plate though so we would only recommend a side if you are sharing, as there’s lots to get stuck in to. There is also a surf ‘n’ turf option for an additional £4.00. Not only was this dish full of great flavour, it was pure theatre as it arrived to the table, sizzling away on a hot plate. If you don’t like hot and spicy food then this probably isn’t for you, but if you are a fan of sweet chilli dishes, then this is a must try. A sticky chilli sauce glazes the pipping hot chicken that is still moist and cooked perfectly. 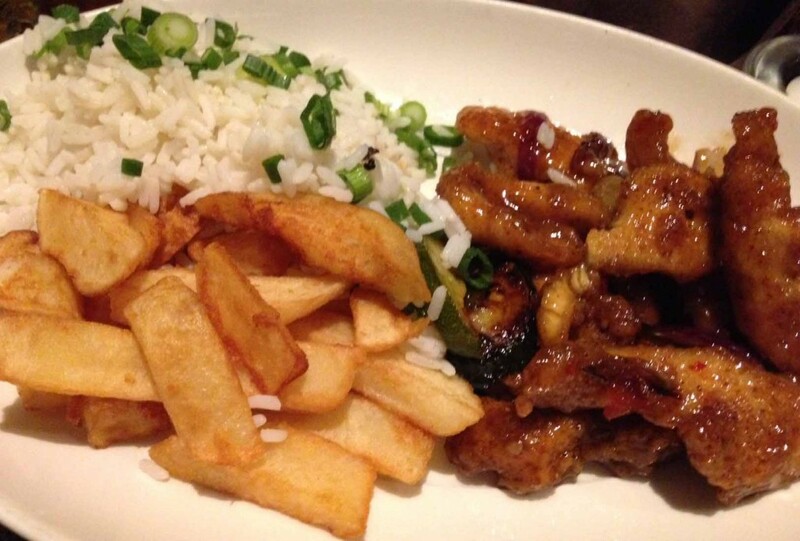 The sizzler is accompanied with either spring onion boiled rice or chips – there’s also a half and half option, which is what we went for. There is also a helping of Mediterranean vegetables to add another textural and colourful element to the dish. They also provide a refreshing cut of flavour to every bite, and this truly is a dish we would recommend you order if you are ever lucky enough to find yourself in The Maghera Inn. There is also the option of ordering a beef sizzler. The Maghera Inn is certainly a place we will be returning to on a regular basis, both by ourselves and also with family and friends. It certainly gets a high recommendation from us and the food is good honest pub grub that has bags of flavour and substance to back it up. The setting is perfect, and a great location if you are looking to enjoy some quiet drinks and great food over the weekend. There are regular acoustic music sets in the pub, and this was just another factor that made our night out even more enjoyable. 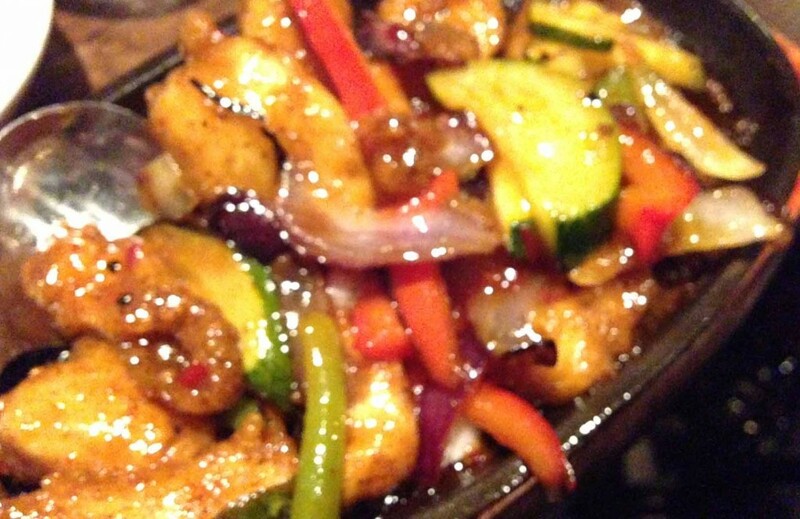 It is also great value for money with 4 main courses and a selection of drinks working out at about £100 – £25 per head. Great value for being wined and dined over the weekend. You can check out the evening menu for the Maghera Inn here, and view their Tripadvisor reviews here. Have you ever been to The Maghera Inn? We’d love to know what you thought of it, as it is one of our favourite local eateries. Share your experience with us by commenting below or connecting with us on Facebook and Twitter. One half of Pikalily, I am a Digital Marketing Manager by day, and food and travel blogger by night. I enjoy writing about my food and travel experiences with my wife Helen on our blog, Pikalily.com. I hope you enjoy this post.